We offer a range of high-quality, highly reliable chauffeur services to individuals and businesses in and around the Thetford and Brandon areas. We are available 7 days a week, 24 hours a day. We choose our chauffeurs for their maturity and professionalism and you can expect a consistently high standard when travelling with us. 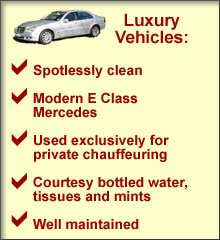 Our modern, E-Class Mercedes are spotlessly cleaned for each new customer. Please click here for further details. We specialise in offering reliable, comfortable airport transfers from Thetford and Brandon to Stansted, Heathrow, Gatwick, Luton, Norwich and other UK airports. See airport transfers for more information. For companies based in one of Thetford's industrial estates, and for other companies based in and around the Thetford and Brandon areas, we offer an executive business chauffeur service to and from meetings or to and from airports, seaports and railway/Eurostar terminals - or even a chauffeur service to a restaurant or London theatre. See our Corporate Chauffeur Services information. "Music in the Forest" at Brandon Country Park - travel in a luxurious, modern Mercedes and enjoy a night out to remember. Centreparcs at Elveden - enjoy a break without the stress of travelling. Unlike many taxi companies, we can store your children's car seats for you so that the whole family can travel in safety. "Go Ape" at Brandon - enjoy a day out and maybe stay for dinner; your chauffeur will be ready and waiting when you wish to go home. Chauffeur service and airport transfers for businesses in and around Thetford, Brandon and Elveden and also for individuals. All customers can expect a professional, polite and reliable service. Copyright © 2017 Unique Websites, Bury St Edmunds. Designed by Unique Websites, www.uniquewebsites.co.uk. All Rights Reserved.